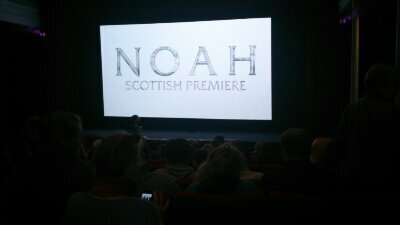 Screenkicker at the Scottish premiere of Noah – Screenkicker! I know when you think about hard journalism and lavish press events with huge celebrities you automatically think of Screenkicker. This is the site that brought you such in depth pulitizer troubling articles as Steven Seagal talking about Crimea and the top 5 films about Jesus (that Jesus isn’t in). So you won’t be surprised to hear that I was guest of honour at the Scottish premiere of Darren Aronofsky’s Noah in Scotland’s glamorous capital Edinburgh. Except that’s not exactly how it went. No, I wasn’t invited, and yes, in classic Screenkicker style the adventure began with a lunchtime beer. All of this is a roundabout way of saying that I heard that Russell Crowe was attending the premiere of his new movie Noah and I showed up hoping to get a glimpse of the man himself. So armed with my phone camera, my friend Rachelle, and a beer and sushi buzz I hung around outside the cinema the premiere was in. I got a few photos of Mr Crowe and then prepared to head home. Little did I know that Rachelle would have the bare-faced balls to walk to the front of the queue and straight up ask for two tickets to the premiere. And guess what? It worked! Five minutes later we were walking up the red carpet, Rachelle still carrying her shopping bags from earlier and me looking like someone who had too much alcohol and Japanese food (an accurate assessment). Following this we sat in our seats, choking back the smell of the pork that was slowly rotting away in the shopping bags while Russell Crowe introduced the film. So what did i learn that day? Firstly perishable foodstuffs should not be stored under a seat in a packed cinema. And secondly – fortune favours the brave/annoying. 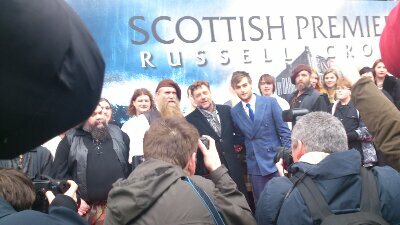 Look out for a full review of the movie coming soon courtesy of this first time red carpet reporter. Ha ha I’m even starting to think I might have liked the film too now. Just needed a bit more preparation for such a biblical epic!! Cheers mate, was very unexpected! No(ah) way did this really happen!! Except I met you in the pub after, and yes you were drunk and also carrying a crumpled beer stained Noah poster. Good for you Mikey! Rachelle sounds amazing and clever, stick close to her from now on, it’ll only benefit you. Nice! If only Southampton ever had premieres I’d give it a go! 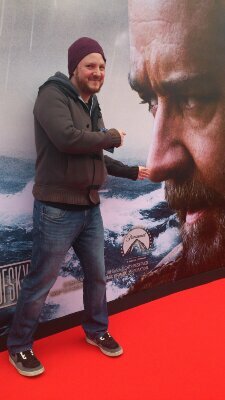 You look like you’re about to pick Crowe’s nose. Hey, that rhymed. Simply. Glorious. I’m gonna start having a beer at lunchtime and see what kind of shenanigans/movie premieres I can get into! Imagine the fun packed lives alcoholics have! That’s awesome !! Glad you got in, thank god your friend had the ballz.